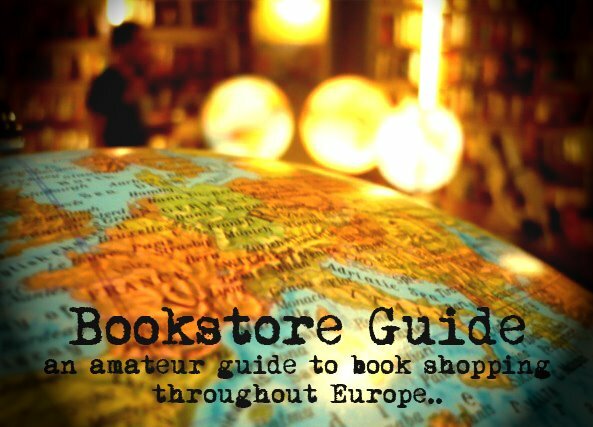 Bookstore Guide still remains “a guide to European bookstores” but upon returning from our recent US trip we were inspired to write a report about our impressions of the bookstore scene in New York City and Boston, the two cities we had a chance to visit. 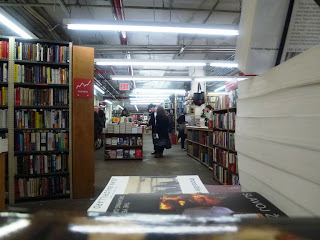 This is its first part, which describes our bookstore discoveries from NYC. We have tried to visit many bookstores during our stay - this is just a selection of the ones we found the most interesting. We know we have missed many great ones but perhaps we’ll get to visit those some other time. In general, we were a little disappointed by the small number of secondhand bookstores. Also, the used books were quite expensive for our liking, usually around half of the cover price, except for the occasional selection in a thrift store. We really liked the fact that independent bookstores and independent local businesses in general are something that defines the neighborhoods, something that the local people are proud of. 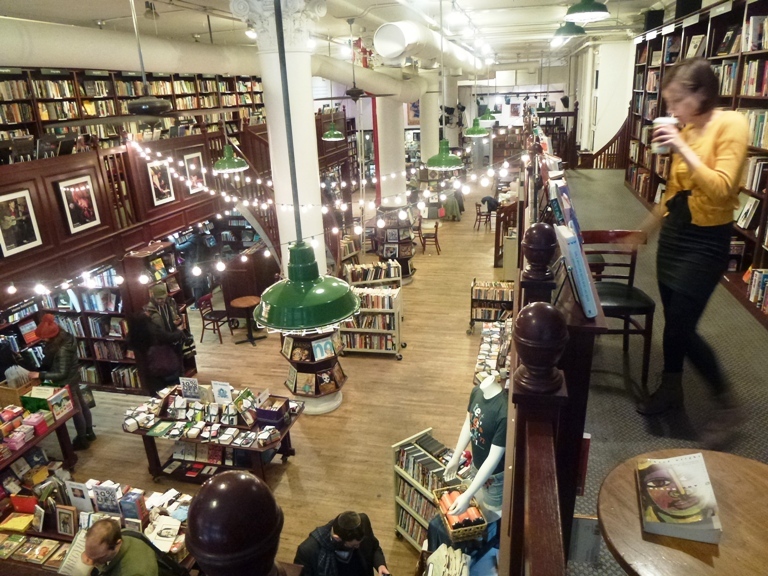 Our bookstore tour started at The Strand, located at 828 Broadway, at the corner of E 12th St., New York’s biggest bookstore which famously carries 18 miles of books. The Strand is a true legend in NYC and it has been in business since 1927. The bookstore is huge and was full of people browsing even way past 8PM. We liked the discounted bookshelves which lined the store’s walls outside where browsers were not discouraged neither by the darkness nor the chilly weather. The overall impression from The Strand was that of a huge library, which doesn’t really need to care about the looks so much, as its reputation speaks for itself. It’s one of those rare bookstores where you can go for a stroll and realize that you’ve just spent 2 hours browsing and have a whole new to-read-list in your head. That is probably the only “disadvantage” of The Strand, as its sheer size and the number of books can make you feel a little overwhelmed as well. Another bookstore bearing the name of the famous English playwright (very popular among European English-language bookstores). This is a local chain of independent stores with 4 locations throughout the City. The location we visited is at 716 Broadway. It is a truly beautiful bookstore, decorated and set up in the traditional fashion (tall wooden shelves with ladders), the books are spread over the ground floor and basement. They only carry new books, and have an exceptionally good selection of dramas and plays, movie scripts and literary non-fiction. The third bookstore we visited turned out to be our favorite of the whole trip. Housing Works is a healing community of people living with and affected by HIV/AIDS. They have a bookstore/café and about a dozen thrift shops throughout the city (in which you can also find a small selection of books – usually cheaper than in the bookstore itself). 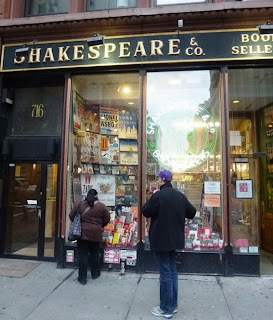 Their bookstore in SoHo has a great location, atmosphere and selection of titles. It’s very spacey and there are tables set up right among the shelves, so you can enjoy a cake or coffee from the café. The selection was just the right size, not too huge and not too small and for some reason, we’ve enjoyed this place the most. Many people were just sitting and sipping coffee, leafing through the books they’ve picked, before deciding whether they’ll purchase them or not. We also really liked their idea of pre-made book packages as Christmas gifts (two to four books which had something in common, with a short funny note explaining the connection). 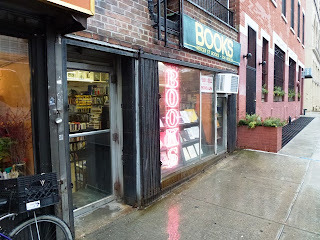 You can't miss Mercer Street Books because of the large neon sign "BOOKS" which lures you in. We were more than glad to enter as the bookstore offered a great shelter from the pouring rain.It is a large, solely secondhand store, but our expectations of low prices in New York weren’t met even here, with the prices of books mostly around half the cover price (ranging from 6 to 9 dollars). 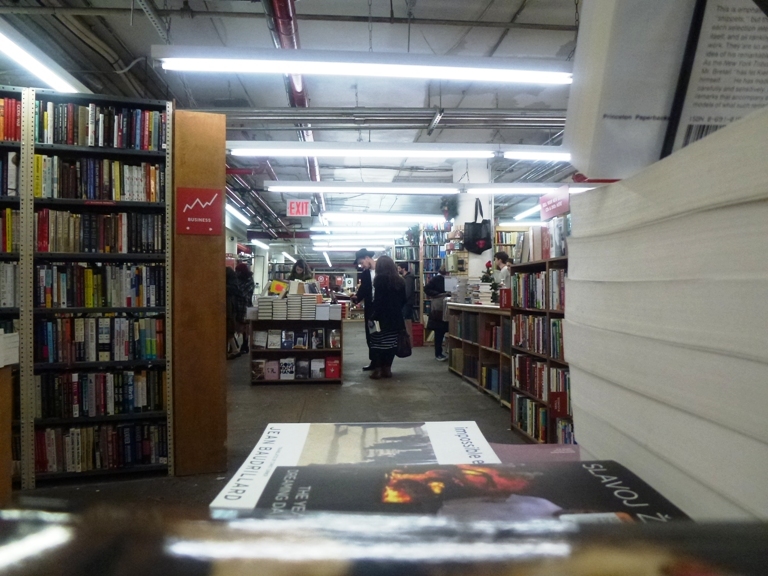 It was in Mercer Street Books that we finally accepted that the pricing of secondhand books in NYC is what it is. This bookstore fulfills everything you expect from a neighborhood secondhand bookstore. A mish mash, greatly stocked sections and some poorly stocked ones, rather random, but this isn’t necessarily a bad thing – sometimes best things can be found when not looking for them. It was the name of this bookstore that caught our attention and made us enter although we were hungry and in search of some place to eat. 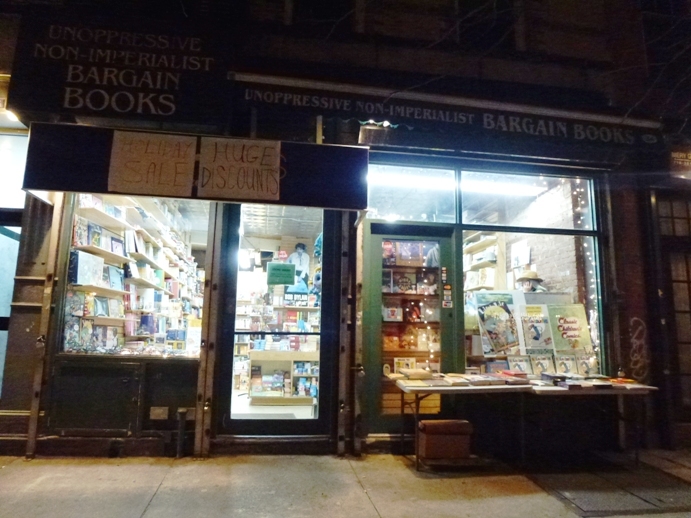 This peculiar specialist bookstore is certainly a place you should drop in if in West Village (Greenwich Village). The owner not only stocks ‘unopressive non-imperialist and bargain books’ but also a huge selection of books on Bob Dylan. The Dylan books are displayed in the very center of the store and we have no reason to doubt that it is the biggest selection of Dylan books in NYC. Of course, Bob Dylan's tunes were also playing in the background. The whole selection of the store was very interesting with lots of books by the Beat Generation authors, a shelf full of Noam Chomsky, many titles on Eastern philosophy and especially Buddhism. What’s more, most of the books were bargain priced. The store doesn’t even have a proper website, but a blogspot blog, which hasn’t been updated in over 2 years – that’s how nonconformist the owner of this store is. Located in Greenpoint, Brooklyn, this is the best example of a local independent bookstore, greatly appreciated by the whole neighborhood. The sense of community and the friendly atmosphere is really obvious in this place. Word is a small bookstore which carries a carefully selected stock – it’s one of those places where you can safely ask the bookseller for a recommendation and you can also be sure that they’ll be able to tell you something about each of the titles they stock. 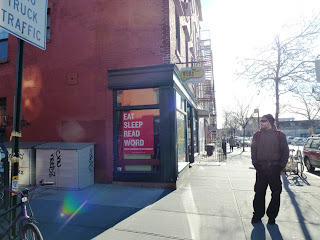 Another Brooklyn store, in the hip part of Williamsburg – the “hip” word seems to define this store, perhaps it even accentuates (or exaggerates) its appearance. Both new and used books find their place in this tad overpriced store beaming with coolness. Don’t get us wrong, it’s a really nice bookstore with a quality selection of titles, but it just seemed to us that some of coolness is a bit calculated. This creates an atmosphere where you feel that even the customers are doing their best the look the right way, act the right way and even pick the right books... But the same thing can be said about any other store in Williamsburg, so maybe it’s just the initial impression that wears out with time. 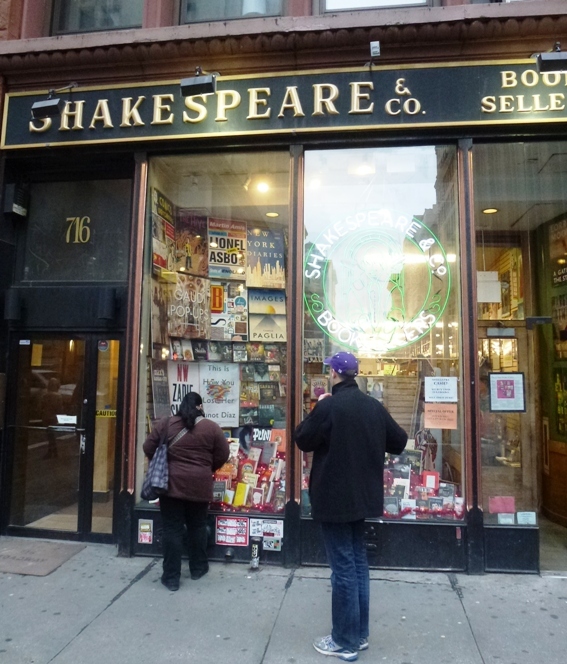 We also visited some other bookstores which we haven't mentioned in this short report. In case you've been to a New York bookstore and you feel it deserves a mention, please feel free to leave a comment below. 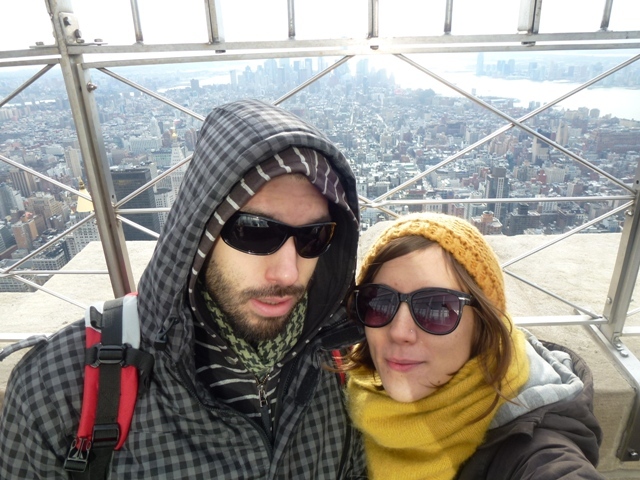 We are definitely planning on going back to the Big Apple some day and checking out many other things which we missed during our first visit. One bookstore you did not mention, but perhaps you visited, is the Argosy Bookstore (http://www.argosybooks.com/) on East 59th Street, between Park and Lexington Avenues. 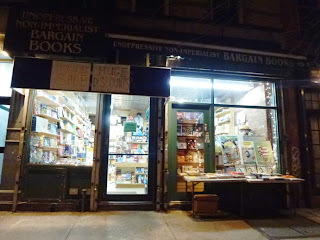 Here is an example of a used, actually antiquarian, bookstore that would also have succumbed to gentrification and inflated real estate rents and values, except for the fact that a very forward-looking previous generation of the store's owners bought the entire building many decades ago when it was still very cheap. This is the only reason they have been able to stay in business to the present day. Some other places for used books you may want to list in a future report are some of the Salvation Army stores around town, as well as the St. Francis Thrift Store, located at the Holy Name Catholic Church on the Upper West Side of Manhattan. We've read several articles about the Book Row and we would have loved to see it for ourselves (no time travel though...). We also planned to visit Argosy, but the one time we were close to it it was closed, so we'll have to leave that for our next (we do plan to come back) visit. We will surely be smarter when it comes to used books next time and focus more on the thrift stores you mentioned (other friends recommended the same). 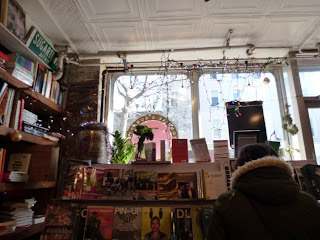 We really liked the fact that independent bookstores and independent local businesses in general are something that defines the neighborhoods, something that the local people are proud of.